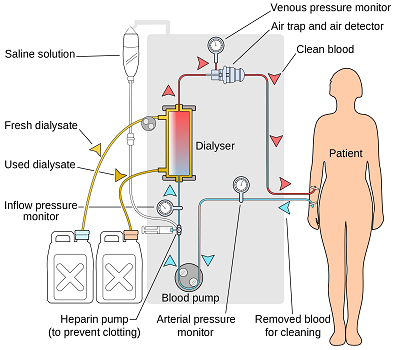 In hemodialysis, a machine filters wastes, salts and fluid from your blood when your kidneys are no longer healthy enough to do this work adequately. Hemodialysis is the most common way to treat advanced kidney failure. The procedure can help you carry on an active life despite failing kidneys. Hemodialysis requires you to follow a strict treatment schedule, take medications regularly and, usually, make changes in your diet. Hemodialysis is a serious responsibility, but you don’t have to shoulder it alone. You’ll work closely with your health care team, including a kidney specialist and other professionals with experience managing hemodialysis. You may be able to do hemodialysis at home.